For other uses, see Camberwell (disambiguation). Camberwell is a suburb of Melbourne, Victoria, Australia, 10 km east of Melbourne's Central Business District. 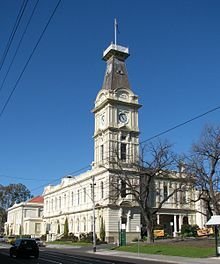 Its local government area is the City of Boroondara. At the 2016 Census, Camberwell had a population of 22,081. The western, southern and eastern boundaries of the suburb generally follow Burke Road, Toorak Road and Warrigal Road respectively. The northern boundary generally follows Riversdale Road, except for an area in the northwest where it extends upwards to Canterbury Road, incorporating Camberwell, East Camberwell and Riversdale railway stations. Known for grand, historic residences and tranquil, leafy streets, Camberwell is commonly regarded as one of Melbourne's most prestigious and exclusive suburbs. A feature of Camberwell is the Burke Road shopping strip, which stretches north, approximately 600 m from Camberwell Junction, where three tram routes converge—the 70, 72, and 75. Halfway up the shopping strip is Camberwell railway station, which services the Belgrave, Lilydale, and Alamein train lines. East Camberwell, Riversdale, Willison, and Hartwell stations also lie within the suburb's boundaries. Several bus routes also cover the area. The historic Rivoli Cinemas sit just west of Camberwell Junction, in the adjacent suburb of Hawthorn East. Camberwell has several parks, reserves and playgrounds, most notably, Frog Hollow Reserve, Fordham Gardens, Cooper Reserve, Bowen Gardens, Lynden Park, Highfield Park, Riversdale Park and Willison Park. Camberwell is home to a number of notable head offices, including Pacific Brands and Bakers Delight. Camberwell received its name as a result of an early settler being reminded of the way three roads intersected in the south London district of Camberwell. This intersection is now known as Camberwell Junction. 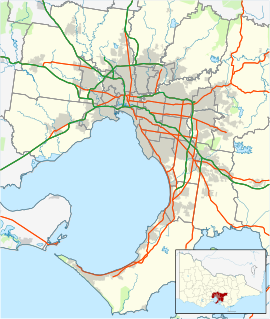 The development that followed was a product of the expansion of Melbourne's suburban rail network in the 1880s. Camberwell Post Office opened on 12 October 1864. The Prospect Hill Road Precinct area is adjacent to the railway station and is the oldest part of the suburb. The original subdivision was relatively generous blocks, which were quickly filled with fine Victorian and Edwardian houses. Due to its hilly topography, many east-west streets in the Prospect Hill area have an excellent view of Melbourne's Central Business District. Its main commercial centre developed along Burke Road from its railway station to Camberwell Junction, 500 m to the south. Several tram routes converge on this point. Though the area was originally agricultural, Camberwell is now one of the most well-established of Melbourne's affluent suburbs. It is part of the City of Boroondara, the local government area with the lowest socio-economic disadvantage index in Australia. There is almost no industrial land in Camberwell, and commercial uses are concentrated near the Burke Road precinct, which has long been one of the busiest in suburban Melbourne. House prices in Boroondara are well above the metropolitan median and those in the Prospect Hill Road Precinct are several times the Boroondara median. The median price of a four bedroom detached house in Camberwell in April 2018 stood at a little over A$2.5 million while the median rent was A$895 a week. In the 1980s a planned major development to the east of the Burke Road shopping strip met substantial opposition from local residents. National Mutual Life Association proposed a 24,000 sq.m. three-storey enclosed shopping centre, which drew substantial objection. Developer Floyd Podgornik's Podgor Group (Podgor) purchased the site from National Mutual in 1987 and submitted revised plans to Camberwell Council. When the Council approved Podgor's plans in 1988, 400 residents stormed the meeting. At elections later that year, anti-development protesters won control of the Council and although the developer subsequently proposed a lesser development, in 1990 it rescinded its decision to approve the shopping centre. Subsequently, Podgor sued the Council to court and was awarded $25m in damages. Similar opposition was mounted regarding plans dating from 1999 to develop Camberwell railway station to incorporate retail and office development. High-profile present and past residents Geoffrey Rush and Barry Humphries supported the protest action, but the development was finally approved in 2009. East Camberwell, Hartwell, Riversdale and Willison are four officially named neighbourhoods, within the general area of the railway stations of the same name. The southern areas of the Prospect Hill Precinct (from the south side of Prospect Hill Road to Riversdale Road) were developed for the Riversdale Estate, Kasouka Estate and Gladstone Park Estates from the late nineteenth century. The Kasouka Estate was created in 1891 and included Kasouka Road, Trafalgar, Prospect Hill and Riversdale Roads. Kasouka Road has a high level of visual cohesion and is dominated by Victorian and Edwardian period villas. According to the 2016 census of Population, there were 22,081 people in Camberwell. 66.9% of people were born in Australia. The next most common countries of birth were China 5.4%, England 3.5%, India 2.2%, New Zealand 1.9% and Malaysia 1.7%. 72.6% of people spoke only English at home. Other languages spoken at home included Mandarin 6.8%, Greek 2.6%, Cantonese 2.0%, Italian 1.6% and French 1.2%. The most common responses for religion were No Religion 36.2%, Catholic 22.1% and Anglican 11.0%. Kylie Minogue and Dannii Minogue, Australian singers, were raised in nearby Surrey Hills and attended Camberwell High School. Camberwell is well-serviced by public transport, with three rail lines, three tram routes and three bus services operating throughout the suburb. The Camberwell Sunday Market has been operated by the Rotary Club of Balwyn since 1976 and comprises 370 stallholders, selling secondhand clothing, books, furniture, and crafts. Camberwell Football Club participated in the Victorian Football Association from 1926 to 1991. Since October 1996 the Camberwell Magpies Cricket Club has played in the Victorian Premier Cricket competition. Ten churches were established in the area; Camberwell South Anglican Church, St Dunstan's Anglican,St John's Anglican, St Mark's Anglican, Our Lady of Victories Basilica, Salvation Army, Methodist (now Uniting), Presbyterian, Greek Orthodox, Church of Christ and Baptist. Camberwell Baptist Church was constituted in 1891 and has met on the same site in Riversdale Road, Hawthorn East, near Camberwell Junction, since its inception. City of Camberwell - the former local government area. ^ a b c Australian Bureau of Statistics (27 June 2017). "Camberwell (Vic) (State Suburb)". 2016 Census QuickStats. Retrieved 12 April 2018. ^ "Planning amendment may soon be tested". The Age. 27 November 1985. Retrieved 15 December 2009. ^ "Burke Road project deadline set". The Age. 29 October 1986. Retrieved 15 December 2009. ^ "Camberwell residents await Podgor moves". The Age. 7 October 1987. Retrieved 15 December 2009. ^ "Camberwell residents storm council". The Age. 17 May 1988. Retrieved 15 December 2009. ^ "Podgor plan in doubt". The Age. 8 August 1988. Retrieved 15 December 2009. ^ "New junction plans go to Camberwell council". The Age. 17 May 1989. Retrieved 15 December 2009. ^ a b c "Battle Stations". Melbourne: The Age. 28 April 2004. Retrieved 15 December 2009. ^ Lahey, Kate (9 July 2009). "State policy wins: Camberwell project approved". Melbourne: The Age. Retrieved 15 December 2009. ^ "Community and neighbourhood centres | City of Boroondara". www.boroondara.vic.gov.au. Archived from the original on 3 July 2015. Retrieved 1 June 2015. ^ "Digitised Resource Viewer". digital.slv.vic.gov.au. Retrieved 20 March 2017. ^ "Camberwell Conservation Study 1991" (PDF). Archived from the original (PDF) on 24 March 2016. ^ "The evolution of Edna". The Age, Melbourne. 21 January 2006. Retrieved 11 August 2009. ^ "Born today...Kylie Minogue". Brisbane Times. 28 May 2008. Retrieved 11 August 2009. ^ "Kylietown". The Age, Melbourne. 8 October 2006. Retrieved 11 August 2009. ^ "Fashion victim". Sydney Morning Herald. 30 April 2003. Archived from the original on 9 December 2012. Retrieved 11 August 2009. ^ "Adam Plack". Maestro. Archived from the original on 20 July 2011. Retrieved 11 August 2009. ^ "Rush hour". The Age, Melbourne. 8 March 2007. Retrieved 11 August 2009. ^ "285 Doncaster Park & Ride - Camberwell via North Balwyn". Public Transport Victoria. ^ "612 Box Hill - Chadstone via Surrey Hills & Camberwell & Glen Iris". Public Transport Victoria. ^ "70 Waterfront City Docklands - Wattle Park". Public Transport Victoria. ^ "72 Melbourne University - Camberwell". Public Transport Victoria. ^ "75 Etihad Stadium Docklands - Vermont South". Public Transport Victoria. ^ "Camberwell Sunday Market". Rotary Club of Balwyn. Archived from the original on 1 October 2009. Retrieved 16 December 2009. ^ "Camberwell". fullpointsfooty.net. Archived from the original on 2 January 2010. Retrieved 16 December 2009. Wikimedia Commons has media related to Camberwell, Victoria.